TL; DR: LiveChat has been on the leading edge of text messaging and chatbot customer service applications since 2002. The company helped pioneer the chat-tech space as the market emerged, and its forward-thinking approach gives LiveChat a leg up in what has become a competitive industry. Today, LiveChat provides services for more than 26,000 business websites in 150 countries. And the company’s three primary solutions — LiveChat, ChatBot, and Knowledge Base — allow businesses to curate branded and enjoyable customer experiences. Chat platforms that connect companies to visitors browsing their websites are ubiquitous today. So, it may be easy to forget that the technology wasn’t developed all that long ago. LiveChat, an online customer service support platform, rolled out its first live chat software in 2002 to give businesses a more efficient way to connect with their website visitors through a simple interface. Back then, text messaging wasn’t the global phenomenon it is today; in fact, no one had any idea whether texting would take off, much less emerge as a support channel. “We never expected text messaging to become one of the most important channels in the customer service market, but it has completely changed the definition of customer experience,” said Szymon Klimczak, LiveChat Chief Marketing Officer. But LiveChat was ready for this change. Today, the company ranks among the top three live chat support providers in the world across the top 1 million sites on the internet. And its software monitors 23 million chats per month and has been adopted in more than 150 countries. LiveChat allows businesses to quickly respond to customer needs through automation. While so many companies find its chat features and tools useful, LiveChat hasn’t rested on its laurels. Instead, it has continued as an early adopter and innovator of technologies that have since become commonplace. Its forward-thinking accomplishments include moving from on-prem delivery to SaaS in 2010. In 2017, it began developing ChatBot, a tool that companies can use to build their own bots, and Knowledge Base, an AI platform that allows companies to prepare a public help center in which customers can find answers to questions on their own. Knowledge Base also lets support agents quickly send links to company help articles. For nearly 20 years, LiveChat’s growth has hinged on its ability to predict, adopt, and develop products before they become trends. One of the most significant changes LiveChat has seen in the customer service marketplace is the introduction of AI automatization. But the company has been preparing for the technology to become prevalent. “This has been a focus of our development strategy for some time,” Szymon said. LiveChat rolled out ChatBot in 2017 when the technology was still nascent in the industry. And when LiveChat felt the bot functionality was robust enough, the company introduced a full-scale bot-building platform for its clients that integrates with many of its other main live chat features. Some of the platform’s most useful tools include Customer Message Sneak Peek, which allows service representatives to understand what customers are typing before they send a message. This feature ensures that customer needs are met quickly and relevantly. “We see that bots are great supporters of the traditional customer service teams, and many businesses want to add them to their current communication strategies,” Szymon said. And ChatBot is easy for in-house programmers to integrate with the technologies a company already has in place. For example, a hotel could create a bot that allows guests to book single or double rooms depending on their responses to a series of automated questions. And no programming experience is necessary to create new ChatBot scenarios once the solution is integrated. The LiveChat team attributes the success of those bot features to its focus on identifying industry trends. To encourage that forward-thinking mentality, the company of about 150 people has a monthly meeting focused on industry trends. “We have marketing experts, growth hackers, content writers, developers, and software engineers, but also amazing support staff who enable, on average, 35,000 chat conversations with our customers every month,” said Szymon. At these meetings, then, this diverse array of workers discusses specific trends within their sectors, and considers how end users of the product interact with LiveChat while contacting companies or browsing on their websites. “This meeting helps us to generate ideas for the future development,” Szymon said. Though LiveChat continues to adapt its technologies to modern user needs, it doesn’t chase every trend. Instead, the company focuses on the ones that will help it achieve its mission of connecting customers and businesses anytime, anywhere. “Every time we plan to launch a new functionality, we think about how it will make business communication faster and more efficient,” Szymon said. That promise to improve customer service has encouraged LiveChat to expand its offerings to provide functionalities like online sales and self-service. It also spurred LiveChat to strengthen its original chat application. Initially, the company’s products required clients to go through LiveChat to create the tools they needed. In the spirit of helping businesses assist more customers, LiveChat opened its platforms so companies could build customized support tools. Knowledge Base leverages previous customer support experiences to answer questions faster. This open attitude is apparent in one of LiveChat’s latest offerings: Knowledge Base. Knowledge Base uses AI to leverage the experience of customer service specialists to help companies build robust online help centers. If customers have questions, they can find the information on their own quickly — even during non-business hours. 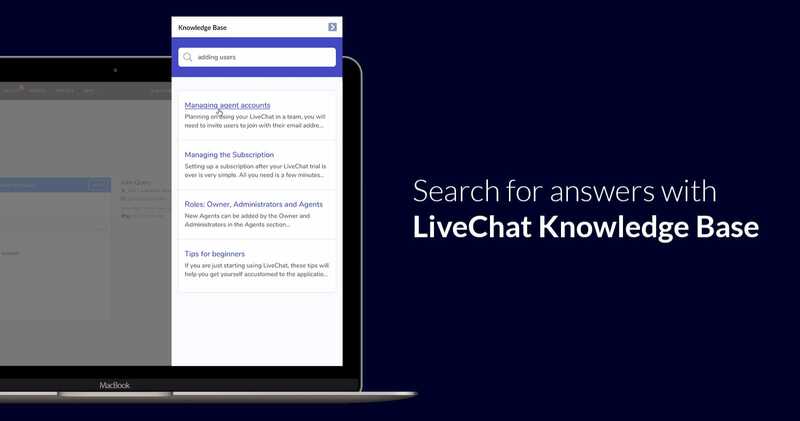 And by adding the Knowledge Base widget to the LiveChat app, agents can find help resources when chatting with customers without switching between applications — this enables faster response to customer queries. LiveChat tools can also direct customer requests from a variety of channels — including website chat, email, and contact forms — to a centralized app. That means customer service representatives can monitor issues more efficiently. LiveChat has been helping companies meet their customer service needs since 2002, and has seen a rapid evolution in the industry from phone to text to AI chat. But one thing has remained steadfast through the years: LiveChat’s commitment to helping businesses satisfy customers. “The most common benefits of our products are happier customers, bigger sales numbers, and lowered costs of support,” Szymon said. Many companies have increased customer satisfaction levels using LiveChat, including cPanel, a Linux-based web hosting control panel, which reached a 94% user satisfaction rating. Web host Lunarpages improved its sales by 15% after adding LiveChat tools to its website. And LiveChat is working to stay ahead of trends to help businesses achieve those numbers in the future. “The technology business is so demanding and prone to change that our growth strategy must be just as challenging,” Szymon said. That’s why LiveChat continues to explore user requests, which often lead to organic insights on which functionalities are most relevant and how people use them. LiveChat has been successful because of its ability to predict and deploy market-leading technology effectively. And the company has developed a robust and far-reaching action plan that fosters innovation and growth.